Green certifications to look for when specifying tile. As sustainability has become an important consideration to consumers and architects who are designing for better environmental stewardship, green building programs have emerged to certify which buildings meet specific sustainable design goals. Materials used in these buildings are an important part of sustainable design as they can contribute to good indoor air quality and energy efficiency. The focus on tile in this presentation clarifies the many ways that this product can contribute to a green building certification in such programs as USGBC LEED®, NAHB Green Builidng Standard, and the ICC’s International Green construction code. 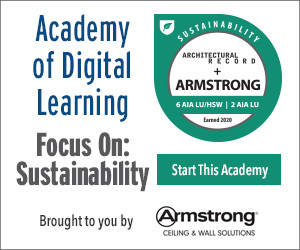 The design professional will also learn about the ANSI (138.1) Green Squared standard for defining a green tile – a standard developed by the North American Tile Council with the input of designers, architects, green professionals, end users and manufacturers. Along with a review of the latest sustainable manufacturing practices, this presentation illustrates how the selection of tile as a green material is an easy choice for design professionals.